Easy to install and use. Universal bike crank puller. The hardness of this product is strong, please do not let your children play with they. QUALITY MATERIAL:This crankset extractor Made of high-carbon steel material, durable and timeproof,Ues as any 20 teeth spline type isis bottom bracket. 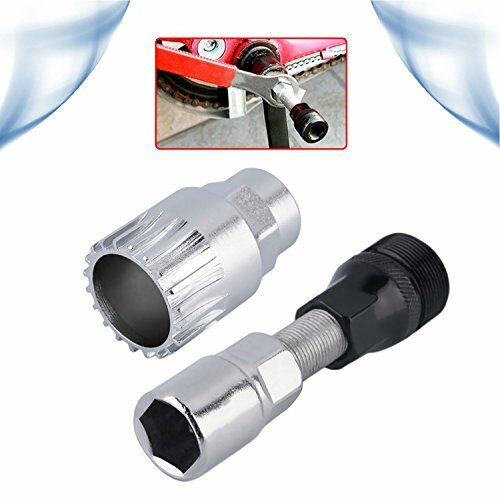 SAVING YOUR BIKE:This crank puller use for removing chain-rings and crank,When your bike accident happens on the road ,Helps you get out of troubles fast.No need parking on road wait for help. PRODUCT SIZE:You just need an adjustable spanner or a 5/8 or 16mm spanner;Item size: 79x21 mm/3.1x0.8 inch. QUICKLY START:Easy to install and use, The Crank Extractor is used to remove square type crank arms,The Bottom Bracket Remover can be used with either a 24mm socket,.wrench or an adjustable spanner. If you have any questions about this product by Od-sport, contact us by completing and submitting the form below. If you are looking for a specif part number, please include it with your message.